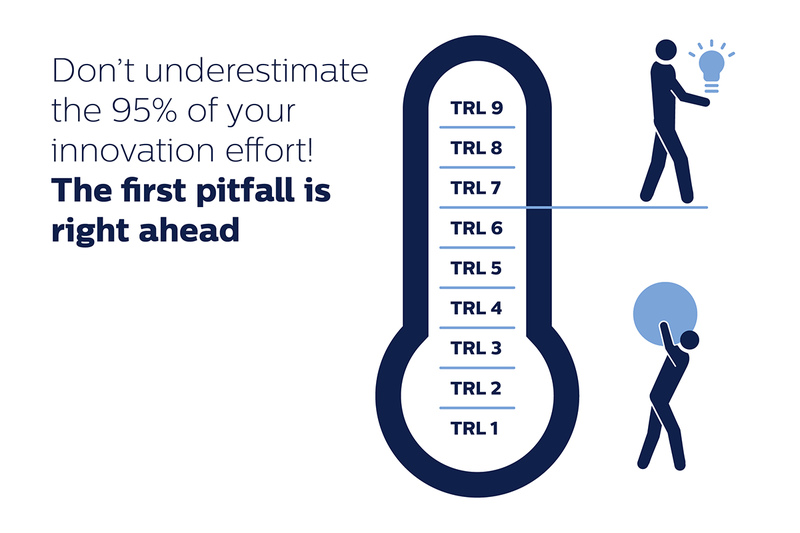 Don’t underestimate the 95% of your innovation effort! Moving from having a great idea, about 5% of your innovation effort, to up-and-running new business will cost you the other 95% of the effort. So you have sifted through tons of information. And based on your innovation strategy selected the best ideas, and developed those into great value propositions. For some useful concepts go to selecting ideas. You have made clear which benefits you will offer which customer segment. Which business model you will use to monetize your attractive business case. Which new technology will provide a great, industry-changing new benefit to your customers. Hang on! New technology? Yes, your innovation team decided that your classical, superior quality product needs to enter the realm of Internet-of-Things and Smart-devices. At least, that is what you believe they said. Now you have to be very careful, the 95% of effort is right ahead of you. Ensure that it does not become 99.9% of the effort! Three frequently visited pitfalls loom ahead.